This article may contain affiliate links; there’s a possibility I could earn income when you click through one of these links and sign up for an account, make a purchase, etc. This article is written for entertainment purposes only and should not be construed as financial or any other type of professional advice. Health savings accounts (HSAs) are tax-advantaged accounts that offer a way to set aside funds for healthcare expenses. To qualify for an HSA, a consumer needs to be covered under a high deductible health plan (HDHP) and not a traditional one. I have been insured by a HDHP and opened and managed an HSA in the past but have traditional health insurance now. A high deductible means that I'll have to pay healthcare expenses up to a certain level before my insurance company pays my medical bills. Health insurance policies specify these thresholds but the HDHPs carry unusually high ones. By having money inside an HSA, I can cover higher-than-usual medical bills for which I'm responsible. For example, if our family's deductible is $6,000 and someone has to have a surgery that costs $5,000, then we're on the hook for $5,000 — even though, technically, the procedure is covered by my plan. That is, the procedure might be discounted based on negotiated rates with my insurance company and expenses applied to my deductible. But I still have to pay the surgeon, the facility, and the anesthesiologist out of my own pocket. Still, the HSA can ease the burden of paying for healthcare. I'll get a tax break on contributions and owe no taxes on withdrawals for qualified medical expenses. So, basically, a medical bill that I pay with HSA funds is discounted by 15%, 28%, etc. — whatever my marginal tax rate is. If I fund the account, I'll have money to pay for medical expenses. If I fund the account and don't need to use the money right away, then my funds grow tax-free. Money in an HSA can be carried over from year to year and, generally, is portable, meaning I can take the money with me when I change employers (even though a HDHP may be tied to my job). Money in the HSA can be withdrawn in retirement: tax-free if I'm paying for medical expenses and taxed at ordinary income tax rates if I use the money for regular expenses. To establish and fund an HSA, I must meet eligibility requirements. I must be covered under a HDHP. The IRS defines a HDHP as one with a high deductible but also a maximum limit that includes the deductible and out-of-pocket (OOP) expenses. In 2015, the minimum annual deductible to qualify for being a high deductible is $1,300 for an individual and $2,600 for families; the maximum annual deductible plus OOP is $6,450 for individuals and $12,900 for families. Note that the individual references HDHP self-coverage, not income tax filing status. That is, based on my interpretation of IRS guidelines, my spouse and I could have separate HDHPs and separate HSAs. However, I couldn't be covered under my spouse's traditional plan and fund an HSA. In addition, to be eligible for an HSA, I can't be enrolled in Medicare, have other health coverage within certain guidelines, and can't be claimed as a dependent on someone else's tax return. Contributions can be made by my employer, me, and anyone else who'd like to fund my account. Employer contributions are not included in income. An employer may make a contribution on my behalf, giving me free money that is similar conceptually to an employer match on 401(k) contributions. My contributions and those made by others on your behalf are deductible, even if I don't itemize deductions. If contributions are deducted from my paycheck and deposited to my HSA, I may be able to avoid payroll taxes on these dollars. There is a limit to annual contributions. Generally, my husband and I can contribute up to $3,350 as an individual and $6,550 as a family in 2015. When I'm 55 and older, however, I can contribute $1,000 more. Note that we must be eligible the entire year to make the full contribution; otherwise, the allowable amount is prorated. Distributions taken from our HSA must be reported on our income tax return using Form 8889. Distributions used to pay qualified medical expenses are not taxed. Generally, money withdrawn from an HSA for other expenses are taxed at ordinary income rates. They are also subject to a 20% penalty when I'm under 65. In many cases, I may be issued a debit card to pay for qualified medical expenses. The process may vary from plan to plan, but I should be able to choose which expenses to pay using HSA funds. HSAs are set up with qualified HSA trustees and custodians, including banks, insurance companies, and other IRS-approved firms. I may choose to hold funds with an employer's vendor or its insurance company. Alternatively, I can open up an HSA with a third party. Firms that offer HSAs include HSA Bank, Bank of America, and UMB. Dollar minimums for buying and selling investments, such as mutual funds, ETFs, stocks, etc. I may be able to get a waiver on monthly fees by using my employer's vendor or holding a certain level of cash. My money can be held in an FDIC-insured account, an investment account subject to risk of loss, or both — depending on the rules of my custodian. So, if I think I may need HSA funds to pay this years' medical expenses, then I could consider holding that amount in cash and invest the excess that I shouldn't need for many years. The HSA offers a great way to save for medical expenses. Not only can I designate funds for healthcare (as well as dental care) but I can also get many tax benefits. These advantages are the ability to: 1) deduct contributions from income and lower my taxes; 2) build an account balance tax-free; and 3) withdraw funds tax-free for qualified medical expenses. Furthermore, I can treat the HSA as an important component of my retirement savings plan. During my retirement years, I can use HSA money to pay qualified medical expenses including some insurance premiums. Alternatively, I can use funds in this account for other expenses; in this scenario, I'd pay ordinary income taxes on distributions, similar to a traditional IRA or 401(k). Again, it's notable that I can accumulate qualified medical expenses over a period of years and receive reimbursement from my HSA for bills I paid years ago. Even if I become ineligible to contribute to an HSA (for example, I enroll in Medicare or my new employer offers a more traditional health plan), I can still keep my account. Though there are many benefits to HSA, there are also some downsides. The biggest drawbacks are 1) high fees often associated with these accounts; 2) relatively low contribution limits, which — combined with high deductibles — may make it difficult to build a large account balance; and 3) complex rules relating to HSA contributions and distributions. The expenses associated with maintaining an HSA can be high and overpriced compared to a regular brokerage account or IRA. For example, HSAs typically have monthly maintenance fees and may have limited investment options comprised of high-expense mutual funds. High fees can easily erode my account's value, especially when there's a relatively low balance; that is a $50 annual maintenance charge can erase 5% of a $1,000 balance but doesn't affect an account with $10,000 as much. As offerings become more competitive and cheaper, though, the HSA may emerge as a cost-effective way to save for healthcare and retirement expenses at all levels. Credit unions may have inexpensive or even fee-free accounts to consider. Currently, we can save up to $6,550 for a family each year. But this amount may be difficult to save if I'm also paying a lot of money for healthcare services. If I happen to incur costs for surgery or emergency room visits in a given year, then I'll likely experience high out-of-pocket costs and won't have the extra cash needed to make a contribution to the HSA. Of course, high out-of-pocket costs are not the fault of the HSA but rather a reason that I might not be able to afford to make contributions to the account and fully enjoy its benefits. To ensure I'll be able to take full advantage of tax benefits, I'll need to make an extra effort to keep good records. Up-to-date records can prove 1) I'm eligible to make contributions and 2) my medical expenses qualify for tax-free distributions. The rules are somewhat complex so I'll need to stay on top of them and/or hire a tax professional to assure compliance with regulations. Finally, there is one feature of the HSA that is a disadvantage compared to its cousin, the Flexible Spending Account (FSA). Both allow me to set aside money for medical expenses and get a tax break for saving. But I must have funds available in the HSA to pay expenses, unlike the FSA that allows me to pay a bill before I've fully funded the account. 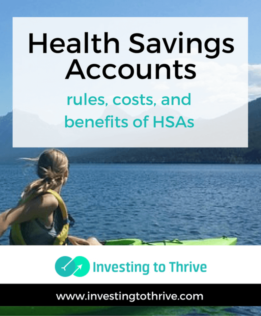 The HSA is a tool that can help me save on taxes and medical expenses. Choosing the right one — with minimal fees and expansive investment choices — can allow me to grow my investment balances while I enjoy cost savings.